I previously discussed Leybold’s excellent models, past and present. Steve, who is a gentleman and a scholar in addition to being a model enthusiast, sent a list of Leybold models from a book chapter written by Anne Walton . Either this was an incomplete list or Leybold’s offerings exploded during the 70’s; Walton’s 1978 book states Leybold had around 100 models for sale! Unfortunately, that list has shrunk to the 14-or-so now available. Progess in Stereochemistry. Vol. 4, B. J. Aylett and M. M. Harris, eds. (Butterworths, London) 1969. A. Walton, Molecular & Crystal Structural Models (Ellis Horwood, Chichester, UK, 1978) p. 73. 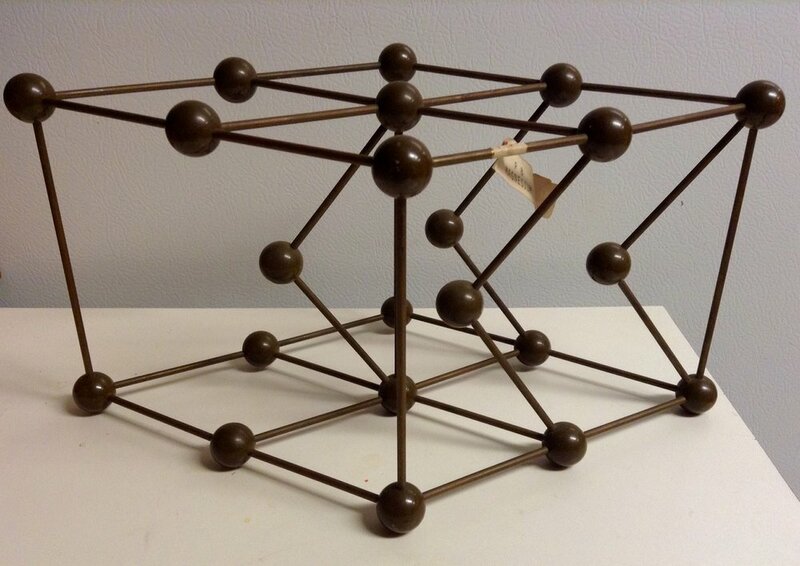 I recently came across a vintage item on Etsy: a beautiful crystal structure model of two fcc unit cells. However, the description claims that the German manufacturer, Leybold, is no longer around. To which I said to myself, "Huh?" There were a few other details in the description that are wrong as well, but the fact that Leybold is no longer around was news to me. Leybold's roots start all the way back to 1850 when it was started to distribute pharmaceutical and other technical equipment. Ernst Leybold was actually serving as manager for the founder who died a year after starting the company, and E. Leybold sold it in 1870. The company started producing vacuum pumps in 1906 when they also got out of pharmaceutical equipment. In 1948, the Metallgesellschaft conglomerate invested in Leybold, and Degussa did so in 1955. In 1967, Leybold merged with Heraeus Hochvakuum, and thus was born Leybold Heraeus GmbH, a scientific and technical equipment juggernaut that was around for the next 20 years. Metallgesellschaft and W.C. Heraeus sold their shares in 1987, and the new company, solely owned by Degussa, was renamed Leybold AG. In 1994, Degussa sold Leybold to Oerlikon, which merged it with Balzers AG. (I always wondered why my process pump in grad school was a Balzers-branded Leybold!) In 2006, Leybold Vacuum was renamed to Oerlikon Leybold Vacuum. And then in 2015, Oerlikon sold the unit to Atlas Copco, who renamed it to Leybold GmbH. Now we have the vacuum part of the story straight. (Well, as straight as 168 years of mergers and acquisitions can possibly be.) How about the models? Well, Leybold had been making equipment intended for education/demonstrations all along. 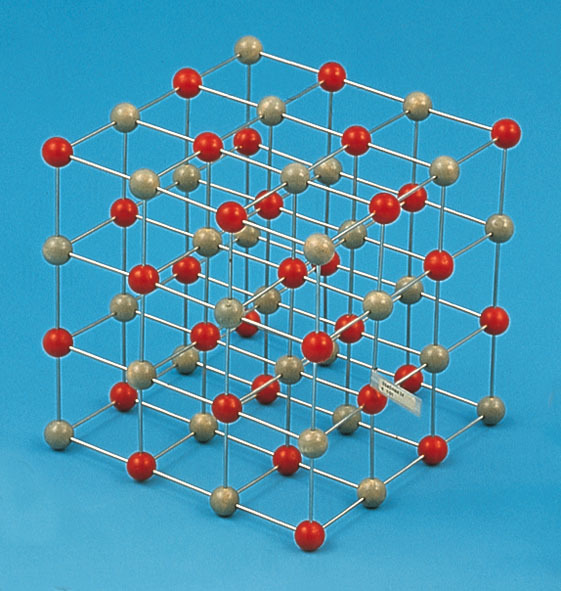 (While I'm not sure when they began selling crystal and molecular models, I've noted that Deane Smith's monograph in 1959 makes no mention of commercial sources and Arnold Beevers started his company in 1961.) Anyway, around 1985 (during the Leybold Heraeus years), Leybold Didactic GmbH was started. In 2000, they sold the division to private investors. The company unfortunately went bankrupt in 2008. However, they were bought by an investor consortium in 2009 and now operate under the name LD Didactic, which maintains the Leybold brand name in scientific teaching supplies. 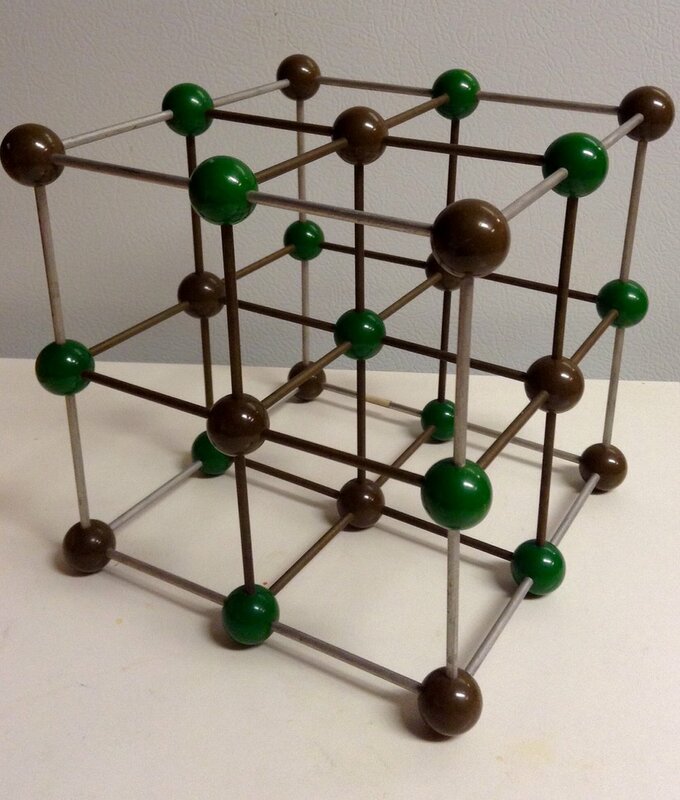 So is Leybold still making crystal structure models? Yes! 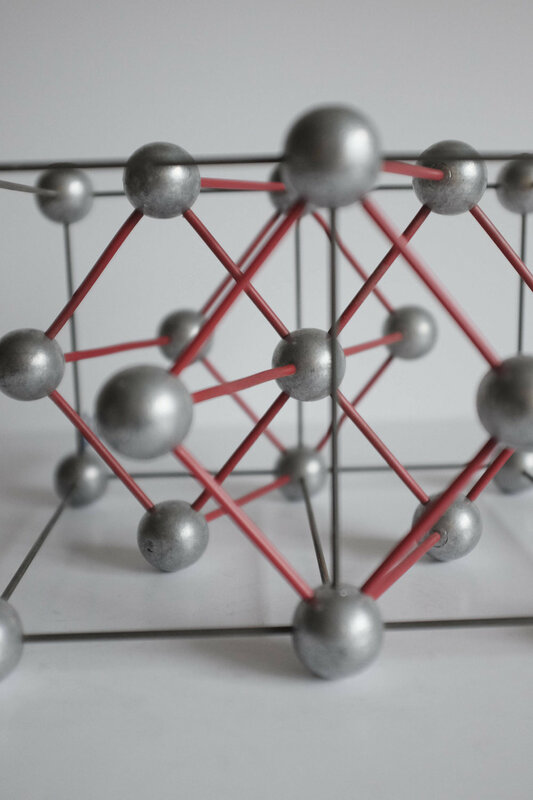 Besides the all-plastic models that are now ubiquitous on the internet, they still sell some of the wooden ball and steel spoke models that aficionados still seek out. However, their product line is shrinking compared to just a few years ago. Rock salt, wurtzite, cesium chloride, calcite, graphite, diamond, generic triclinic, magnesium, and copper. 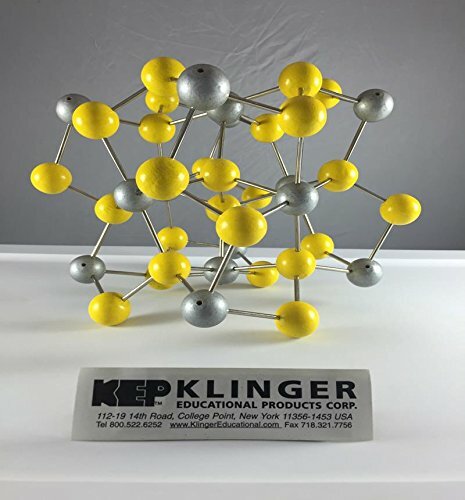 Klinger Educational, who have their own line of crystal structural models, are also the U.S. distributor for LD Didactic. If interested in anything from Leybold (besides vacuum pumps), you should contact them for a quote. Who knows when this line of classic models will be gone? I noticed that Klinger is now selling their crystal models on Amazon. I've included a few samples below. Klinger Educational is also the U.S. distributor for Leybold's line of models. I’m not sure how that arrangement works, but I’ve noticed that Klinger has a wider range without much overlap with Leybold. 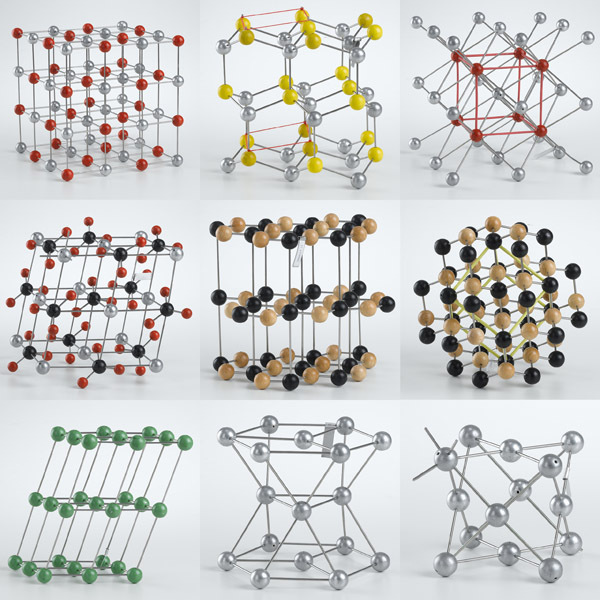 Happily, there seem to be plenty of crystal structures for everyone…myself included. The wooden ball-and-spoke models that I've written about before seem to have had a fan in Albert Einstein. 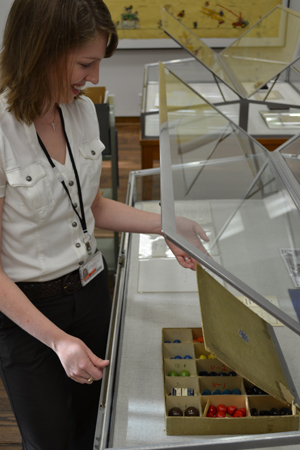 A couple years back, writer Jenn Shapland recounted her experience as an archivist encountering the kit made by the Fisher Scientific Company. It was acquired at an auction in Atlanta by a Dallas woman who donated it to the Harry Ransom Center's Einstein collection at UT-Austin after learning about a theft of a page of Einstein's notes. It's a rather interesting essay about possession. By the way, apparently Einstein's kit included custom parts that included atoms with flattened sides in addition to the usual spheres. Also, the colors included some unusual ones: blue, orange, yellow, black, green, dark blue, beige, and brown. Sargent-Welch's model. You can buy this particular set for $296.25 at Urban Remains. Sargent Kit resold by Stansi Scientific (purchased by Fisher Scientific in 1967). 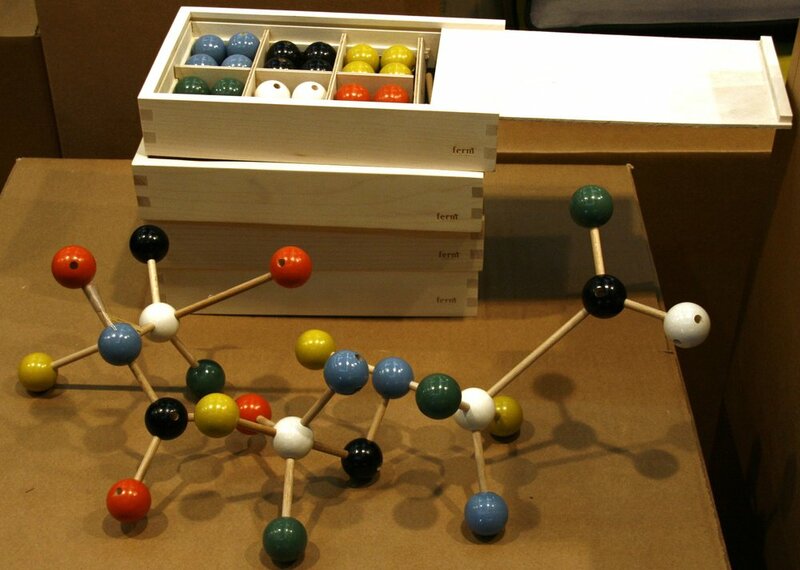 A few years ago, a Danish company called Ferm Living began selling a molecular model kit as a design product. Sadly, they were discontinued, but as you can see below, the color scheme was gorgeously mid-century. Obviously, the pegs were chosen for artistic purposes, but I find it interesting that the kit included trigonal bipyramidal (black and white balls) and T-shaped (blue) geometries. Is a tetrahedron that difficult? Anyway, there seemed to have been some manufacturing problems, which is inexcusable for a product that retailed for $80. Molecular Building Set from Ferm Living. Discontinued. Today, if you want the classic wooden ball-and-stick aesthetic, you can, of course, contact me. Also, there's still one manufacturer who's continuing to build large quantities of these kits and components. There's also the DIY method, but holy cow, clamping a ball in a cardboard-lined vice seems like a very bad idea! 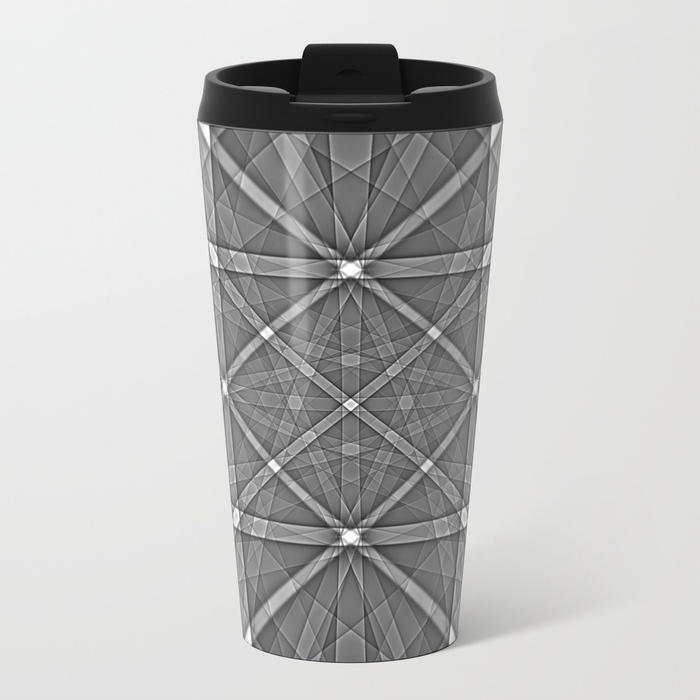 Truth in advertising here: I'm responsible for the unspeakable geekery necessary to put electron diffraction patterns on a coffee mug. If you have a scientist on your gift list that works in materials science, they're sure to appreciate the Kikuchi lines from a diamond as they sip their favorite beverage each morning. (I know I do.) $24.99 on Society6. This keychain featuring ethanol (the kind of alcohol we can drink without going blind) has a lip that that allows it to be used as a bottle opener. Not cool enough? It's also 3-D printed! Available in a number of metals from Shapeways. This set of glasses is stunning. Each represents a different planet in our solar system plus the sun and Pluto. (Sorry, Pluto.) Available from Think Geek for $50. The ol' clock on the wall says it's neon, so I guess...wait a minute! This laser engraved wooden clock features elements one (hydrogen) to 12 (magnesium). Did I mention it's LASER engraved? From miniFab on Etsy ($44.99). A repurposed microscope will brighten any scientists Christmas morning! Available from NorthernElectric on Etsy for $85. For those whose interests in "paleo" extends beyond what they eat, there's a whole store devoted to realistic, museum-quality models of dinosaur bones and other prehistoric beasties. They're definitely only for good boys and girls. Available on Amazon. Help someone pass the time watching magnetic "sand"....and then spend even more time trying to explain what's going on. Available on Amazon. If you're like me, you're always looking for a new notebook to capture all my good ideas. Well, to capture ideas in general. Cognitive Surplus has made some beautiful notebooks with covers that any chemist, physicist, biologist, or engineer would love. Another one from Cognitive Surplus. (I love those guys.) They have an entire line of glassware etched with appropriate chemical structures (wine, beer, whisky), with physics-y Feynman diagrams, and lots of other brainy motifs. Prices range from $15 for a pint glass to $50 for a set of stemless wine glasses. Based on an old-fashioned brass ring stand and a newfangled glass pour-over, this would be the perfect gift for your coffee-loving chemist or chemistry teacher. Available for $179 from the Coffee Registry on Etsy.